Never have words curdled the blood and savaged the human will like those spoken by Duffy, the eponymous talking cat. Never has a film crawled from darkest reaches of the space beyond space to haunt and terrorize those foolhardy or unwary enough to not avoid it. In John Carpenter’s ”Cigarette Burns,” his first entry into the Masters of Horror television series, he proposed a film called "Le Fin Absolue du Monde." It is a movie so otherworldly and horrifying, that to see it was to invite madness and death. DeCoteau has done one better, and crafted a scream from the void accomplished simply with a laser pointer, MS Paint, and a bored house cat. Johnny Whitaker is Phil, a successful computer programmer who has just retired with a lot of money and time on his hands. His son, Chris (Justin Cone), is looking for love via tutoring. Phil’s wife is a giant piece of driftwood in high heels. Down the road, Susan (Kristine DeBell) is struggling with her cheese puff centered career while trying to manage her two unruly kids, Tina (Janis Peebles) and Trent (Daniel Dannas). 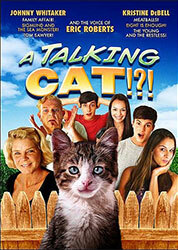 A horrifying specter in the guise of talking cat named Duffy, enters their lives and when he isn’t rambling to himself like a psychotic murderer, lazily attempts to get these two broken families together… because, as he will state several dozen times during the film: He is a talking cat (with voice work literally phoned in by Eric Roberts). The lighting is flat, the music is courtesy of Microsoft Songsmith, and the whole thing feels like an infomercial for herpes medicine. Eric Roberts aside, none of acting is exactly terrible; words come out of mouths in the correct order but with little emotion or conviction. The premise on which the entire film is centered, a cat that talks, is achieved by a flapping black triangle digitally slapped in the general area of the Duffy’s mouth. If you are familiar with any of DeCotau’s 1313 series of films (uh…yeah…me neither), you’ll recognize many of the locations and props. There is something extra odd about seeing a kids movie filled with things from a horror film series that is mainly about young men walking around in their briefs. Just to put an accent on it, there is a very subtle scene between Trent and Chris involving a swimming lesson that threatens to become the most charming romance in the whole film, and had the film went in that direction it actually would have been a welcome respite from a lot of the by-the-book schmaltz on display. The only moment of drama comes via a threatening car. I was curious to see how far the film was willing to go to generate sympathy with an endangered animal (spoiler: Not very far). It’s a cheap way to engage the audience but it works, at least until they reveal exactly happened to Duffy, in one of the most hysterical scenes in the entire film. A Talking Cat?!? is a gentle bulldozer of terrible. The tone is placid, the pace is lazy, but it never stops gradually pushing more and more ludicrous moments onto the screen. It is akin to watching a bland sitcom on a wasted Sunday afternoon, but underneath something feels so wrong, like there is a seething evil just behind every cheese puff and a nameless horror that is masquerading as a talking cat?!? Well played. I'm truly impressed that there's a movie which you dislike to the same degree that I dislike Psycho Shark and Santa and the Ice Cream Bunny. I was beginning to fear that your tolerance for crap knew no bounds whatsoever. I'm a bit too in awe of it, to say I dislike it totally. It is truly astoundingly bad.